This cute little dress is something from Anna H Couture. It is a newer shop and this dress has really charmed me. It’s got a 2 layered skirt that comes as 2 different skirt attachments. I’d rather both skirts be attached together and only use 1 attach point. But it’s still very cute. I went to check out 0 Style again because I saw a new style released a few days ago. I have enjoyed the styles I picked up there in the past. I picked up these 2 styles in my preferred texture. The style on the left is Misty on the right is Eleanor. 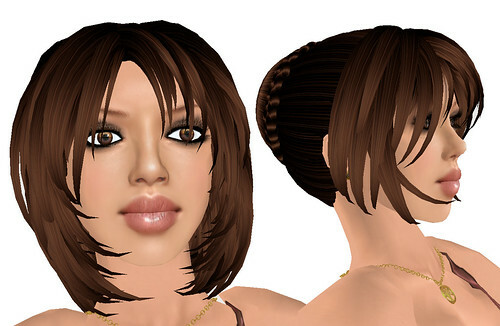 I’ve overheard several people mention that they have a hard time finding good Asian skins in Second Life. So I mentioned that to Ayesha of Skin Within when she was needing ideals. The result is Jia. She is a completely new body which is modifiable skin tone like all the Skin Within lines. Ayesha used a combination photosourcing, airbrushing and handpainting. The skins have a sheen (almost like body oil) to them. A single pack of skin, shape, brow & eyes cost L$1,200 with a 6 pack costing L$3,600. You may notice I’m not wearing my normal shape with this one as I felt it really should be photoed with the included shape, but I also have bonus face-shots [1, 2] with the skin with my normal shape. Also have bonus photo with more skin exposed. I’ve paired it with 2 different styles of my favorite Japanese hair from 0 Style. You are currently browsing the Rei Gully – 0 Style category at SL Fashion Notes.